Phoebe Waller-Bridge Has Been Summoned to Improve the New James Bond ScriptAt Daniel Craig’s specific request. Cary Joji Fukunaga Will Direct the Next James BondDanny Boyle quit last month. Danny Boyle Quits James Bond Movie Over Differences, Creative DifferencesWhat will happen to Bond 25? Danny Boyle Reportedly Top Pick to Direct Next James Bond MovieThough it’s not a done deal. Girl With the Dragon Tattoo Sequel Casts Actor to Take Over Daniel Craig’s RoleSwedish actor Sverrir Gudnason will star with Claire Foy in The Girl in the Spider’s Web. What’s New on Showtime: October 2017Jay Pharoah’s new show White Famous, a documentary about George Michael, and more. What the Hell Is Daniel Craig Doing in This L.A. Riots Movie?What is this random British white dude doing in Kings? Daniel Craig Confirms What We All Suspected: He’s Playing James Bond AgainHe also insists this will be his last time in the iconic role. 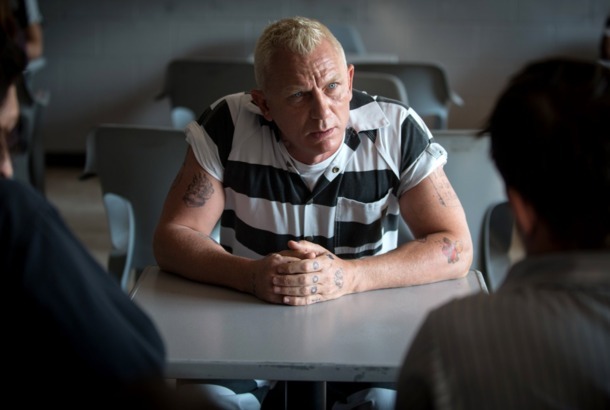 In Logan Lucky, We Finally Get to See Daniel Craig Having FunAs an incarcerated bomb expert in Logan Lucky, the actor gives a performance you didn’t think he could. Is Daniel Craig Returning to Play James Bond?Dashing the hopes of Idris Elba fans everywhere. Logan Lucky Trailer: Ocean’s Eleven, Meet NASCARSteven Soderbergh’s new comedy stars a Who’s Who? of Yee-Haw. Tom Hardy Is Playing Coy About James Bond“If you talk about it you’re automatically out of the race. Theater Review: A Pair of Reinvented OthellosUnmoored from tradition. Bond or Not, Daniel Craig Is Setting Himself Up Nicely for the FutureIt’s no easy feat, but Craig seems to know what he’s doing. Daniel Craig Maybe Almost Bankrupted SkyfallThe plot hole police are gonna love this one. Daniel Craig, Halle Berry Join L.A. Riots Drama KingsThe British actor will play a white “loner” who lives in South Central. Showtime Picks Up Daniel Craig Purity AdaptationShooting on the 20-episode series starts next year. Craig, Heigl May Do Soderbergh’s Logan LuckyAdam Driver, Seth MacFarlane, Channing Tatum, and Riley Keough are already in the film. Daniel Craig Has Some Interesting Bond-Girl OpinionsLike: Rihanna over Beyoncé. Skyfall Has Best 007 Opener of All TimeAnd it’s on track for the biggest overall haul. Edelstein on Skyfall: The Bond Myth Is Mightier Than EverSam Mendes sends 007 into a battle that’s not just Bondian — it’s Oedipal, it’s biblical. And it’s absolutely thrilling. George Clooney Casts Everyone in His WWII MovieD. Craig, B. Murray, C. Blanchett, J. Dujardin, B. Balaban — so many actors. Saturday Night Live Recap: The Limitations of Daniel CraigSometimes dramatic actors don’t make the best hosts. Taran Killam Joshes Daniel Craig in SNL PromosLive from New York, it’s 007! Daniel Craig Confirmed for Two More Bond MoviesRoger Moore approves. Watch This Teaser Trailer for Skyfall Last night’s Olympics opening ceremony was a big moment for Daniel Craig. Seitz on the 2012 Olympics Opening CeremonyIt played like the longest, weirdest, most Anglophilic Oscar-night production number ever. Skyfall Teaser Trailer: James Bond in ReposeGet a look at the new Bond movie, directed by Sam Mendes. Check Out a New Poster for SkyfallLooking good, 007. Watch a New Behind-the-Scenes Video From the Set of SkyfallSorry, Shanghai, but North America wants 007 back! Check Out a Series of Stills From SkyfallOr: How to Wear a Suit. James Bond Is Going to the OlympicsDanny Boyle shot a short film with Daniel Craig for it. See the First Picture of Daniel Craig in SkyfallSo it’s a rom-com, then? Dragon Tattoo Won’t Be Released in IndiaSony says they were asked to cut, not blur, the scenes. Does the Very Chilly Dragon Tattoo Generate Any Sexual Heat?And four other talking points to chew on. James Bond Producer Wants Daniel Craig for Five More MoviesThat would out-Bond Roger Moore’s record. Dream House Trailer: Daniel Craig Is Nicole Kidman From The OthersThere is a twist, and the trailer wants you to know it. See Daniel Craig in Drag for a Women’s Rights PSAJames Bond in a dress still looks like James Bond. Universal Working Overtime to Make Cowboys & Aliens Seem Less FunHow can they better convince us of the film’s “deadly seriousness”? Industry Roundup: Dragon Tattoo, CraigPlus: B.J. Novak signs deal to stick around ‘The Office’ for two more years. Joss Stone Is Virtually a Bond GirlShe’s starring in a Bond video game.